Safely secure your eyewear with this convenient tether strap. 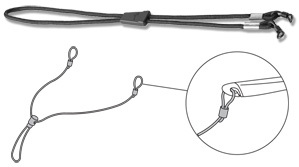 This OEM tether strap is designed specifically for the Vuzix video eyewear. It connects securely to the ends of the eyewear stems and a sliding cinch allows for firm, yet comfortable tightening to suit your needs.